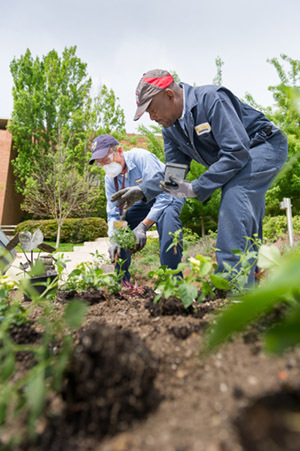 The Landscape Services department maintains Georgia Tech's commitment to a livable, sustainable and beautiful campus. A dedicated team of landscape professionals implement responsible processes and third-party, sustainability certifications. The department's goal is to maintain an attractive and safe campus environment where students, faculty, staff and visitors can live, work and study in comfort. 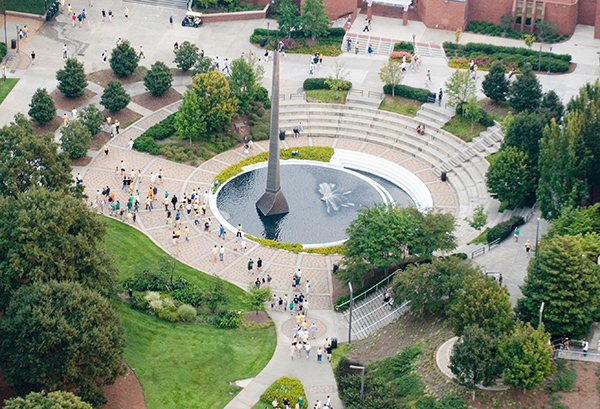 The Landscape Services Department is responsible for the maintenance of grounds and landscape of Georgia Tech’s 426 acre campus. That acreage is divided as 312.5 acres of landscape, 3.5 acres of naturalized land and 110 acres of building footprints. The Landscape Services Department is charged with the maintenance of both the landscape and hardscape, including the 11,642 trees on campus. Through the diligent work of the Landscape Services Department, in partnership with Tech's Capital Planning team, the campus became a Level II Certified Arboretum in 2016. This level is recognized by both the ArbNet Arboretum Accreditation Program and the Morton Arboretum, for achieving particular standards of professional practices deemed important for arboreta and botanic gardens. Do you have a need for Landscaping or Grounds support? Fill out our request form and we will get back to you ASAP. Click here for Pest Control Requests, which are managed by our Utilities Maintenance Department. This comprehensive plan sets direction for the management of our urban forest. Find out more here! In 2015, Georgia Tech's Landscape Services department earned the prestigious PGMS 3 Star Landscape Management Accreditation, and then a Green Star Honors award for campus beauty. PGMS is the Professional Grounds Management Society, a nationally recognized organization that brings together grounds professionals in higher education institutions, park and recreation facilities, and more. PGMS Landscape Management and Operations accreditation is a 3rd-party verified process that requires commitment across three categories: environmental stewardship, economic performance and social responsibility. The PGMS Landscape Management and Operations Accreditation verifies and recognizes an integrated, environmental management systems approach applied to a grounds management. Read more. Georgia Tech was an inaugural signatory of the Tree Campus USA program in 2008 and his since re-certified for a total of 11 years. A program of The Arbor Day Foundation, Tree Campus USA helps colleges and universities establish healthy community forests. We have maintained our commitment on an annual basis through a dedicated tree care plan, supporting tree plantings and other student engagements at Tech Beautification Day and through a tree advisory committee that meets on a monthly basis. Georgia Tech was an inaugural signatory of the Tree Campus USA program in 2008. Extensive green policies and procedures support our commitment to a healthy environment for people and planet. 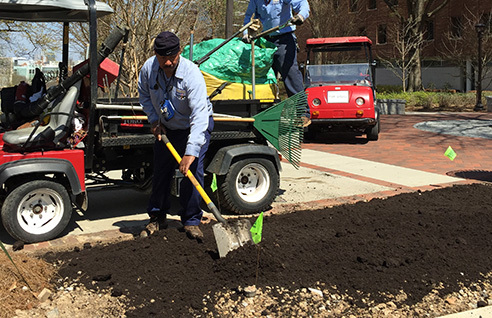 Preserving our bio-load from landscaping activities and re-using that load on campus helps prevent the production of additional greenhouse gas emissions. When organic matter decomposes in an anaerobic environment, methane is produced. Methane is one of the most potent greenhouse gas emissions, being 25 times more potent than carbon dioxide across a 100 year time period. With over 11,000 trees on campus, many that are deciduous, leaf management at Georgia Tech can be very challenging. To keep our walkways and bike paths clean and safe we utilize a combination of giant Versa-Vacs and several smaller vacuums. During leaf season we average 3-4 loads of leaf material at 60 cubic yards per load. These leaves are taken to a site at the edge of campus where they are composted to the point that the material can be used for mulch or soil amendments. All mowers in our department are "mulching mowers". This means that they are equipped with discharge plates, mulching baffles and mulching blades. These pieces work together to ensure proper placement of clippings. By mulching all turf on campus, we eliminate a large amount of organic waste from the landfill while providing moisture and a natural fertilizer for the turf areas. Our tree maintenance crew captures all wood from our maintenance and removal operations. Some of the wood logs are saved and re-used in building structures, where possible. We also require any outside contractors to leave their chips on campus. All wood chips are used on campus as healthy mulch for our smaller shrubs and beds. We estimate that this practice keeps 600-700 yards of wood chips on campus and out of the landfill. The construction of Klaus building in 2007 resulted in the installation of the first significant rain garden on Georgia Tech Campus. This project also included reforestation as part of the sustainability initiatives. Other rain garden locations are behind Boggs Chemistry, behind Laser Lab, EBB/Eco Common and at the Carbon Neutral Building. Thirty three percent of our irrigation water use is from cisterns and wells and we have set a goal to increase that number to 50% on all new construction projects. We utilize an irrigation maagement technology called Calsense. This irrigation system can be remotely controlled when needed. Our landscaping experts are passionate about plants...and people! Klaus raingarden is one of four on campus.